Mr. Venzon also said local governments already face other rules that put them at a disadvantage to private competitors, including the requirement to operate under the N.C. Public Records Law. That “limits our board from operating as freely as a private company. Could we get access to the strategic plans, pricing strategies and competitive analysis for other broadband, cable and satellite providers? That would level the playing field,” Mr. Venzon told DavidsonNews.net. Stop the Cap! has a call to action with more information about the final votes to pass the bill. Thanks to Representatives Faison and Luebke for standing up to the massive monied interests (chiefly Time Warner Cable and CenturyLink) that successfully bought legislation in 2011 after four years of trying. We have provided some of the audio from the House Floor once again - it appears below this call on the Governor to veto the bill by SEATOA [pdf]. Half of North Carolina’s population live in our rural areas, communities where the state’s large incumbent providers have publicly stated their profit requirements prevent them from serving because of their low household densities and incomes. Yet H129 will effectively prevent our communities from providing broadband service, even in areas the private sector refuses to serve, by imposing a series of new onerous regulations on municipalities which do not apply to the private companies. H129’s sponsors claim “unserved” areas are freed from these terminal regulations, but such areas are measured one census block at a time. If 50% of the homes in a census block have access to internet, it is “served.” e-NC reports that private providers are allowed to report that all the homes in a census block have internet service if only one home in the census block has access. As such, North Carolina will have no unserved areas. Because H129 prevents our rural communities from stepping in and providing broadband service when the private sector will not, it will guarantee our rural areas are digital have-nots. (See FCC Commissioner Clyburne press release criticizing H129) For these communities, MCNC’s new fiber middle-mile network will be a bridge to nowhere. A handful of communities in our state, including Wilson and Salisbury, have responded to the private sector’s lack of interest in building the kind of fiber networks needed for our businesses and students to globally compete, by building their own fiber to the home networks. These gigabyte networks are the most advanced in the state (and in the country). H129 seeks to shut these systems down because they compete with the large private companies (Time Warner Cable and Centurylink) who are unwilling to invest in similarly advanced technology. H129 imposes numerous regulations on municipally owned systems that would shut a private company down. While the municipally owned systems have been able to obtain a few exemptions to H129, their service areas are micro-managed by the bill in a way which will arrest their growth. Stopping a company’s ability to grow is the best way to shut it down. It will just be a matter of time. H129 sets a bad precedent of placing the interests of large out-of-state companies ahead of the interests of North Carolina businesses and residents. Time Warner Cable and Centurylink are billion dollar, multi-state companies, loyal only to their shareholders. By effectively prohibiting our local communities from building their own advanced broadband systems, the ability of our state to grow and innovate will be tied to the minimum level of technology these two companies are willing to provide in our state. The result to date, according to FCC data, is that North Carolina’s broadband service is the worst in the country (see attached FCC chart). “North Carolina grown” municipal fiber systems have developed because these local communities, who lost their tobacco economies, recognized that the only way they could survive in the global economy was to match the type of technology Asia and Europe are building. They recognized access to high capacity, affordable, broadband infrastructure is a key driver for jobs and economic growth. H129 creates state law that is in contravention of both federal law and North Carolina’s constitution. H129 newly subjects communications services offered only by municipalities to strict rate regulation and oversight by the NCUC (e.g., §160A-340.1(a)8-9; Section 2. (a)).This is in direct contravention to federal laws preempting the regulation of virtually all cable rates (47 U.S.C.§543(a)(1)); all cable system facilities and services (47 U.S.C. §544(a)); state utility regulation of cable systems (47 USC §541(c)); and federal laws and rules prohibiting state regulation of broadband services. H129 also subjects municipal property used for communications purposes to property tax, in direct violation of the North Carolina Constitution. (§160A-340.1(9) and §160-340.5 compared to N.C. Const Art V, §2(3)). We have lost our tobacco, textile and manufacturing economic base. Access to advanced internet service is the last remaining hope for all our citizens, rural and urban, to compete in the global knowledge based economy using our state’s greatest resource: our ability to innovate. 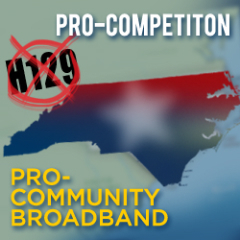 H129 effectively cuts off the ability of our rural communities to provide their businesses and citizens internet access when the private sector will not. It also fails to fully exempt from its onerous regulations, the most advanced municipal fiber systems in our state, with the intention to slowly and painfully put them out of business. North Carolina has a proud history of high-tech leadership in our country. Now is not the time stifle that strong technology history by regulating our North Carolina-based broadband providers for the benefit of a few out-of-state, the multi-billion dollar companies. Now is the time for the public and private sectors in our state to work together so everyone in North Carolina can obtain broadband access. That is what the citizens of North Carolina believe and expect. Please ensure that will happen by vetoing H129.